I tend to eat small amounts throughout the day as opposed to large meals, so it's important for me to have quick solutions for breakfast and snacks. 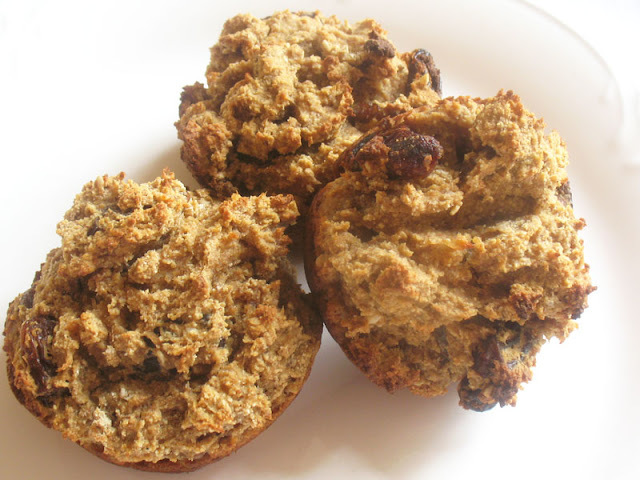 Muffins are always ideal to have on hand, especially when they are packed with protein and fiber like these cinnamon applesauce muffins with plump raisins. Eggless and made with chickpea flour, the muffins are suitable for those following gluten-free and vegan diets. Not that you have to be either vegan nor gluten-free to enjoy one or two. I could hardly wait for them to cool before I started to nibble. 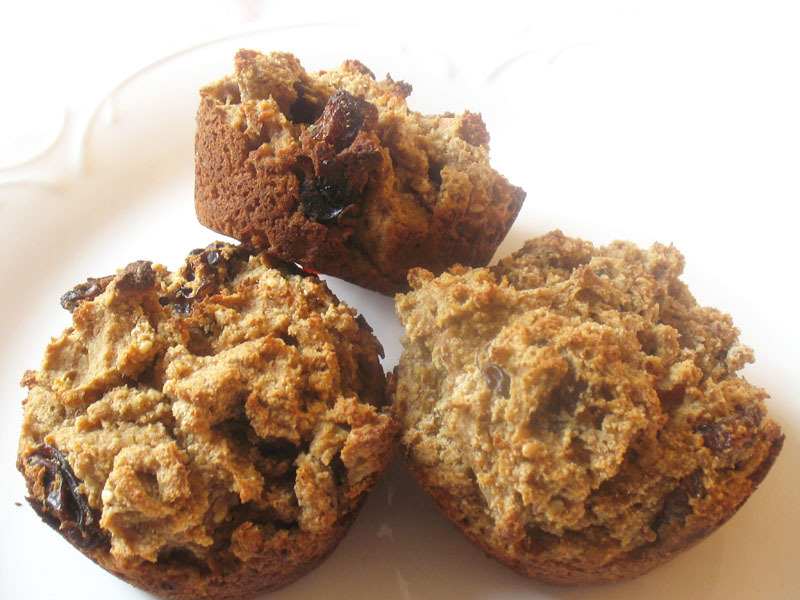 A little denser than muffins made with gluten flours, they are nonetheless soft and moist, with a bit of chewiness from the raisins and a slightly crisp exterior. Filling and satisfying if the urge to overindulge is resisted. My husband had two as part of his breakfast. Grease 12 muffin cups. Preheat an oven to 350°. In a large bowl, whisk together the flours, starch, cinnamon, baking powder, baking soda, sesame or hemp seeds if using, and salt until well combined. In a medium bowl, whisk together the sugar, flax seed, applesauce, coconut oil and vanilla until well blended. Let the mixture stand for 10 minutes. Make a well in the center of the dry ingredients. Add the applesauce mixture and stir until just blended. Gently fold in the raisins. Evenly divide the batter among the prepared muffin tin. Bake for 20 to 25 minutes or until the muffins turn golden and a cake tester comes out clean. Let cool in the pan for 10 minutes and then turn out onto a wire rack. these look yummy and healthy too. Thanks again for all your lovely recipes - I get lost in time scrolling through your archive posts. They do look yummy. I wonder if they would be suitable for a diabetic. 1/3 cup sugar over 12 muffins seems quite reasonable. Thanks for your comment Laurie. I think they would be suitable for a diabetic, especially as I used unsweetened applesauce. Awesome muffins. 2nd batch this week!